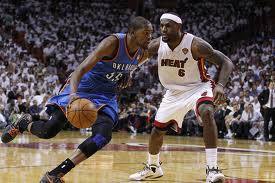 MIAMI -- LeBron James is one win away from a cherished NBA title. The Miami Heat came back from a 17-point first quarter deficit and knocked the Oklahoma City Thunder down the brink of elimiination with a thrilling 104-96 Game 4 victory Tuesday night at the AmericanAirlines Arena. James sat out the waning moments of the contest after suffering an undisclosed injury resulting from a fall. But his fingerprints were all over this mega triumph as the 6-foot-8 juggernaut finished one rebound shy of a triple-double with 26 points, 12 assists and 9 rebounds. With James sidelined, Mario Chalmers stepped up bigtime in the endgame. Chalmers, who chalked 25 points, banked a driving layup in the final 44.6 seconds of play to put the Heat ahead, 101-96. He then nailed two free throws that pushed Miami beyond reach, 103-98 with 13.8 seconds left. "I mean, that kid is not afraid of any moment. We all know that. He's a gutsy kid, "Miami head coach Erik Spoelstra praised the moxie and toughness of his starting point guard during the postgame press conference. Russell Westbrook led all scorers with 43 points in a performance that will surely be open to more debate. The mercurial point guard with a killer, high-release point jumpshot made 20 of a team-high 32 field goals. He also had 7 rebounds and 5 assists to go with 3 turnovers while teammate Kevin Durant tallied 28 points on 9 for 19 field goals. Down 3-1 and on the verge of elimination, Thunder head coach Scott Brooks put a brave front saying, "One of the things I know, I can guarantee this, is we have fight in us. That's what we do. We play every game as if it's the most important game. Obviously, our back is up against the wall. It's win or go home. We have a challenge ahead of us. We understand that. 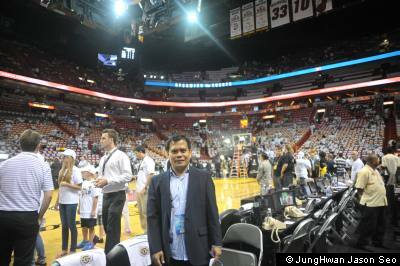 We're playing a great basketball team, some of the best players in the game.."
The author (C) poses at ringside of the AmericanAirlines Arena in Miami before the start of game four between the Miami Heat and Oklahoma City Thunder NBA Finals. Photo courtesy of JungHwan Jason Seo of Korea's Jumpball Magazine.